A year’s worth of fantastic tours and camps led by chefs, cookbook authors and other experts. Unless otherwise noted, prices are for one person, including accommodations but not airfare. Dubai has come to define luxury travel in the Persian Gulf, thanks to the outrageous opulence of its latest resorts, shops and restaurants. 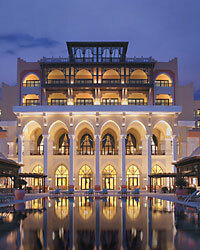 Now the rest of the Gulf is vying for the jet set, with posh hotels opening in Bahrain and Qatar. At the new Shangri-La Abu Dhabi, try regional sweets like basma and Arabic coffee at the hotel’s restaurant Sofra bld (shangri-la.com). Sail along the Amalfi Coast to the towns of Sorrento and Ravello and visit Capri and the ancient ruins of Paestum with Italian cooking expert Peggy Markel (June 11–18; from $3,000; peggymarkel.com). Cycle through Sicily with Boston-area chef Jody Adams. Wine-tasting breaks are included (May 4–11; $4,980; bikeriderstours.com). Meet with baklava makers and shop the markets of Damascus and Aleppo with cookbook author Anissa Helou (May 9–16; $4,000; anissahelou.com). Explore Istanbul’s bazaars and Anatolia’s clay-pot cooking with writer Nancy Harmon Jenkins (April 28–May 8; from $7,200; thevikinglife.com). Forage for crabs in Gulf Coast waters with WaterColor Inn culinary adviser Chris Hastings (October 23–26; $1,500; brownelltravel.com). Help create a sparkling-wine blend at Schramsberg Vineyards’s winemaking camp (March 9–11; $995, lodging not included; schramsberg.com). Learn butchery and other culinary skills at Tom Douglas’s Culinary Summer Camp in Seattle (July 6–10; $2,500, lodging not included; 206-448-2001). Cook Alsatian dishes like choucroute with chefs Barbara Lynch and Maria Helm Sinskey (November; price to be determined; no9park.com). The region’s most prestigious wineries with British Master of Wine Clive Coates (June 22–28; $3,400; bu.edu/foodandwine/tours). Go on private chocolate-factory tours with sweets aficionados David Lebovitz and Mort Rosenblum, followed by a party on Rosenblum’s houseboat on the Seine (May 18–24; $2,895; davidlebovitz.com).